Friends, I’ve been just flattened by a horrible sickness! Headache, runny nose, sore throat, body aches, cough, the whole bit. I’ve spent the better part of the week in bed already, and today’s the first day in awhile I’ve even been upright for more than a few minutes. As usual though, I’ve already pushed myself a little too hard today and really need to rest some more. I’m pretty bad at sitting still, especially when forced to. 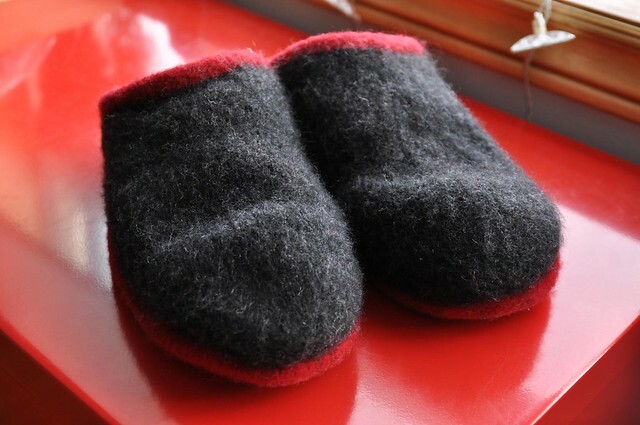 I ran Dale’s clogs through the washer a couple more times, with a kettleful of boiling water added, and they felted to the right size! I guess the lesson is persistence (and boiling water). He’s worn them every day since they dried. 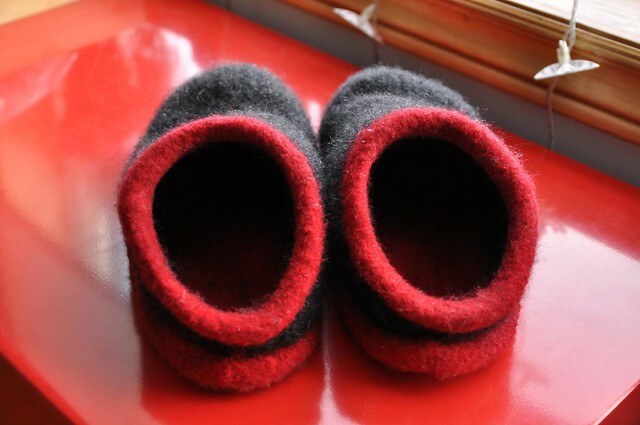 The pattern is Fiber Trends felt clogs, which always come out beautifully. I love the shape! I used 2 skeins of Cascade 220 in red and 1 skein in dark grey. I haven’t put anything on the bottom since we have somewhat shredded hardwood floors (no risk of slipping) but I might add something in the future to help them last longer. My pattern sale is still on until Christmas! 20% off all single self-published patterns totalling $5 or more. There’s no coupon code, the discount will be applied automatically in your Ravelry cart. Hope you are all warm, cozy, and on top of your holiday knitting! These look great. We have carpet, so I am walking around in boot socks. 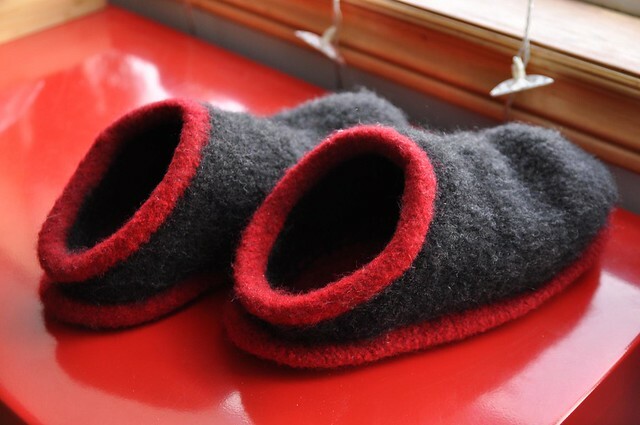 Slippers still sound super attractive even though I don’t need any. I hope you feel better, but have you seen a doctor? Stay hydrated. My personal favorite sick time food is Chicken broth, fresh crushed or minced garlic served warm with sliced lemons.